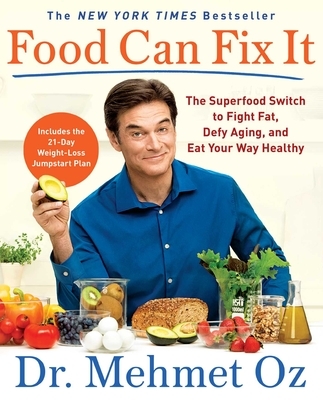 Mehmet Oz, MD, America’s #1 authority on health and well-being, explains how to harness the healing power of food in this “informative, accessible book filled with anecdotes, science, recipes, and guidelines for cooking, shopping, and eating out” (Dan Buettner, author of The Blue Zone Solution: Eating and Living Like the World’s Healthiest People). What if there were a prescription that could slim, energize, and protect your body from major health risks? What if there were a remedy for everything from fatigue to stress to chronic pain? There is. In his groundbreaking new book, Dr. Oz introduces you to this wonder Rx—simple, healing, wholesome food. And he teaches readers how to shop healthy, cook healthy, and eat their way to a longer, healthier life. Food Can Fix It lays out an easy-to-follow plan for harnessing the power of nutrition. With clear information and a meal plan full of superfoods, Dr. Oz explains how to kick-start weight loss, improve your energy, decrease inflammation, and prevent or alleviate a host of other common conditions—all without medication. This nutritional blueprint is backed up by thorough research and enriched with stories from Dr. Oz’s personal history, his family life, and his transformative work with patients. The 21-Day Weight-Loss Jumpstart Plan provides quick, delicious recipes for meals and snacks that will help reverse damage caused by poor eating habits. And full-color photographs show you just how tempting good-for-you food can be. Get started today on a healthy path for life with Food Can Fix It. “Hippocrates once said, ‘Let food be thy medicine, and medicine be thy food...’Now, with Food Can Fix It, Dr. Oz will teach everyone this valuable lesson and explain what it means and how to draw upon the amazing healing powers of food” (Sanjay Gupta, M.D., Associate Chief of Neurosurgery at Grady Memorial Hospital, Chief Medical Correspondent at CNN, and contributor to 60 Minutes). "The doctor's latest is full of what-to-eat recs to help you feel younger, get more energy, ease common ailments and control your weight."